Taiwan Fund for Children and Families (TFCF) invited sponsor children to participate in an exchange program in Taiwan from 15th to 24th March. These nine sponsor children representatives, who ranged from 12 to 23 years old, were from Mongolia, Kyrgyzstan, Swaziland, Vietnam and Cambodia. Regardless of age, they have all taken a positive approach to facing the challenges in their life. Some of them who are still very young are helping care for their families, and others have overcome physical challenges, with the courage to make their dreams into reality. They have all shown outstanding ability in areas like sports, music, art, and academics. The foreign sponsor children representatives of TFCF was received by President Tsai Ing-wen on the morning of 20th March, 2018. The president praised TFCF for providing assistance to children in foreign countries, and said she hopes the government and private sector will work together, and use this positive force from Taiwan to achieve even more. In July 1987, TFCF launched “Foreign Children Sponsorship Program” regardless of race, religion or gender, and also participated in activities of overseas aid. 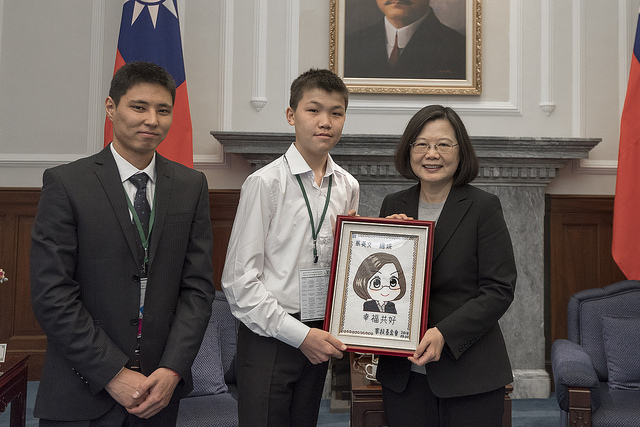 President Tsai stated that by providing diversity service children and needy families abroad, TFCF strengthened Taiwan's connections with other countries. She said the sponsor children came from different countries, but for Taiwan, the relationships through TFCF sponsorship programs have made them all seem like Taiwan's own children. The president invited all the sponsor children to see Taiwan as their second home, and learn more about Taiwan. The president pointed out that as they were growing up, TFCF and the sponsors helped them have the strength to overcome difficulties, and expressed hope that their experience of life in Taiwan and Taiwanese culture during this visit will open up new horizons. The president said that this event holds a special significance, because it was the first time that the TFCF has invited aid recipients to visit Taiwan. So she gave the TFCF a special thanks for their efforts. The goal for TFCF is to spread love, and bring smiles to children around the world. Through our professional services we provide to the children, youth and their families and communities, we hope that our next generation will enjoy their lives in a safe environment with proper care, physical and mental protections and adequate educational opportunities.